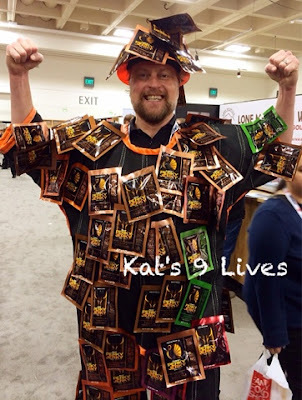 There are so many brands of jerky out there and it is a tough market. Many artisanal brands have come out of the woodwork to compete. One brand that I particularly liked at the Winter Fancy Food Show was Perky Jerky. Their presentation was on point! They made their booth so fun and interactive. The guy wearing the suit was so friendly and funny. I almost felt bad pulling the samples of him... almost! They had a bunch of fun flavors to try. Mine was the Beef BBQ Seoul. The flavors were great. If you like savory and sweet like Korean BBQ then this will definitely be for you. What I love about the product is that the jerky is soft and melts in your mouth. I don't like tough jerkys that will end up cutting the inside of your mouth or is so tough that your jaws get sore. Got to enjoy the jerky and all its flavor! 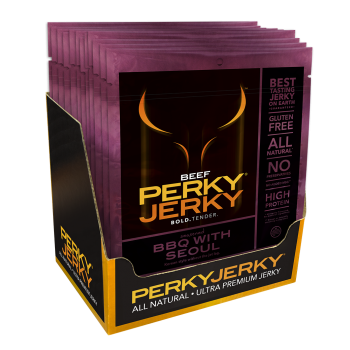 Pick up some Perky Jerky and give it a try.